Whenever we have Italian food, my husband always talks about the North End in Boston. He was in graduate school in Boston. And whenever he and his friends wanted to treat themselves to something nicer than delivery pizza, they would head to the North End for some good Italian. I don’t know whether it’s the rose-colored nostalgia or not. But he still says it’s the best place to get Italian. I guess he is pretty vocal about his “favorite Boston neighborhood,” because one of his co-workers got him a cookbook from a notable (but retired) restaurateur from the area – Dom Capossela. I’m not much into cookbooks, aside from the pretty pictures that is. And this book contained NO pictures. So it sat on our bookshelf for ages collecting dust. But when I did finally take a look at it, there were some basic recipes and anecdotes that I really enjoyed. 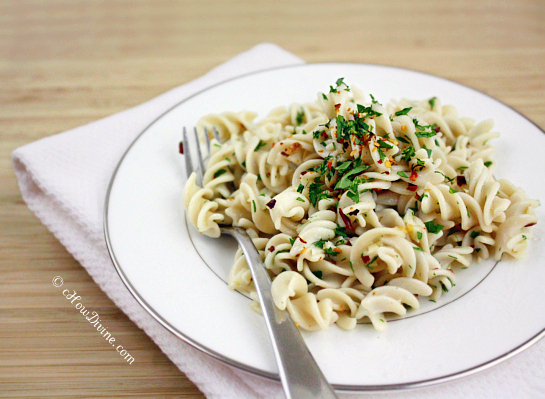 One of those recipes that I make often and enjoy is the basic pasta with garlic oil. It’s one of those non-recipe type recipes. It’s so ridiculously easy that you feel funny calling it a recipe, but you’re glad someone bothered to write it down for you to make. And I’m so glad he did, because it’s the only thing that soothed what was ailing my stomach for the past few days. The recipe takes just about as long as it takes to cook the pasta. Yes, it’s that quick. And you can build on this recipe if you’d like. You can top it with some grated Parmesan or crumbled goat cheese. You can add in some grilled or rotisserie chicken. Throw in some anchovy fillets and allow it to melt into the oil. Yum! Add in or top with whatever you’d like. It’s really a great basic pasta recipe. Cook the pasta according to package directions, but undercook it by about a minute. Drain. While the water for the pasta is boiling, start making the garlic-infused oil. Heat a pan over low heat. Add 3 TB of oil and chopped garlic. Heat the garlic on SIMMER (bubbling in oil without burning) while the pasta is cooking. The garlic should simmer for at least 10 minutes without burning; the garlic will, however, turn golden brown. To the garlic oil, add 1/4 cup of water, the (under)cooked pasta, chopped parsley, red pepper flakes, sea salt, and fresh black pepper to taste. Turn the heat back up a tad if necessary. Gently toss the pasta in the oil and water until it’s thoroughly heated. Taste test. Add more salt and pepper to taste if necessary. Serve on a warm platter. Top with fresh chopped parsley, grated Parmesan, or crumbled chèvre if desired. Chopped garlic should simmer in the oil for at least 10 minutes. If you can, allow the garlic to simmer until the pasta is ready to be added to the pan; however, if the garlic starts to turn deep brown, remove from heat. Just reheat with water when the pasta is ready. It’s no big whoop! Gluten-free brown rice pasta was used for this recipe. Trader Joe’s has a variety of gluten-free pastas at a reasonable price. I love garlic, so I used a lot of garlic for this recipe. But you can use just 2 tsp of chopped garlic if you’d like. 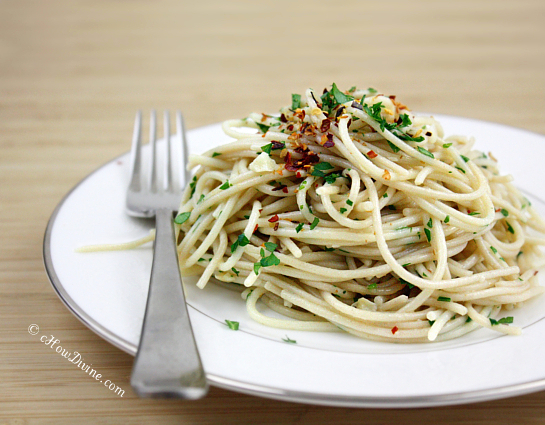 What a fabulously simple pasta! I think pasta was invented just for garlic and garlic oil. Love the addition of the red pepper flakes. I bet that adds a bit of a bite. Thanks for reaching for the dusty cookbook so you could share this recipe. Thank you MJ! The red pepper flakes do provide a kick, which I love. What I love most is the simplicity of the flavors and the preparation. I don’t collect cookbooks either but I do have nice collection that come handy from time to time. Now your pasta came out perfect, and by the way this is one of my favorite ways to eat pasta–Olive oil, loads of garlic, bit of Italian herb mix with sprinkle of red crushed pepper…I could eat this even for breakfast 🙂 And you made it beautifully! Great pictures!!!! Whenever I visit my daughter in Somerville, we always head to the North End for GREAT food! As you say, this has to be one of simplest but most delicious ways to eat pasta.